The SAAF Forum • View topic - TAKOM 1/35 G6 Rhino. Post subject: TAKOM 1/35 G6 Rhino. WIP - I am at present busy making the TAKOM 1/35 G6 Rhino kit. The Alclad II (ALC-408) Armoured Glass tint arrived today so now I can carry on and start putting the body together once I have tinted and installed the armoure glass windows. I am going to be painting my model in the SADF Dark Earth Brown and not the SANDF Camo. Photos to show work up to date as well as a photo found on the net which shows the size of the 1/35 G6 RHINO COMPARED TO A 1/35 CHINESE 152mm TYPE 83 HOWITZER . Post subject: Re: TAKOM 1/35 G6 Rhino. Is that the Takom 1/35 G6 Rhino in the last picture next to the Chinese 152mm Type 83 Howitzer? Apparently that is the BAXMOD resin G6 next to the Chinese Type 83 Howitzer? The G6 body of the TAKOM kit is approx 26cm long (still busy building it), so is still a long body. I have no idea how long the BAXMOD G6 body is. When finished I will put it next to the AFV Club Centurion Mk5/1 or one of the other tanks I have, just to give an idea of size. Are you going to add the machine gun and mount to the top of the turret? What size mg was mounted on top of the turret. Info regards this is not easy to obtain over here in the UK, am asking as at present I do not have any spare mg's or mountings in my spares box so will need to see if I can either get one donated or see if there is one available to purchase. I'm not entirely sure but from what I have been able to find on the net the option appears to be for either a 12.7mm M2 Browning or a 7.62mm machine gun (See Tank Encyclopedia link). I have not been able to find any close up photographs of the mount. - Military Today article on the G6 Rhino. 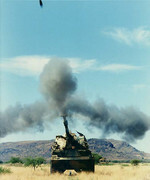 - SADF.info photographs of the G6 Rhino. - Army Technology article on the G6 Rhino. - Tank Encyclopedia article on the G6 Rhino. Edit: Maybe someone can confirm but in one of the photographs in the links I posted above it looks like one of the machine guns could be a FN MAG or similar? I see in the photos on http://sadf.info/ArmourmentsArmyArtilleryG6.html it looks to have a 12.75mm mounted and in the photo on https://www.army-technology.com/projects/g6/ it looks to be a 7.62 FN Mag. Will see if I can obtain one of either, but like you I have not been able to find any decent pics of the mountings.